Your average PC is a fairly uniform size. The familiar ATX chassis will take up the same sort of footprint next to, under, or on top of your desk, and is quite capable of blocking out the sun if you put it anywhere near a window. Why can't we squeeze a normal gaming rig into a smaller chassis when all those consoley things can get away with something only a little bigger than your TV digibox? Well, you can. Small form factor PCs have been around for years, with the smallest generally used for media-based machines with only a light gaming bent. For an actual gaming machine you'll need to look at the like of Shuttle's range of rigs. But they're still pretty chunky. 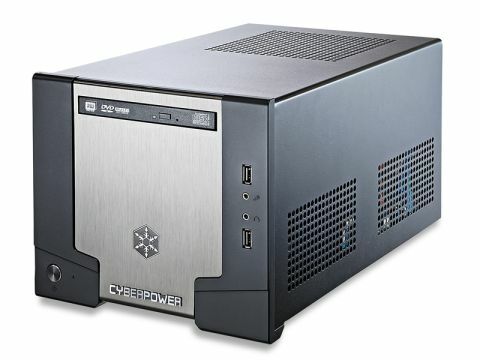 CyberPower has picked up Silverstone's lovely little SG-07B case and dropped all the features of a top-notch gaming PC in it. What enables this tiny chassis to accommodate a full rig? First, you can fit a standard ATX power supply underneath the storage and optical drives. Second, the space allocated to the graphics card allows any dual-slot GPU to be fitted. Even the elongated HD5970 would fit. Third, mini-ITX motherboards are now so feature-rich that you're sacrificing very little in order to slim down. The Gigabyte H55-based board is absolutely tiny, and yet still has a PCIe X16 slot, support for dual-channel DDR3 RAM up to 1600MHz and USB 3.0 ports thrown in for good measure. It's not a bad little overclocker either. The Core i5-760 CPU hums away inside at a thoroughly commendable 3.6GHz. We've seen 4GHz+ from this chip on full rigs, but cooling has to be an issue with a machine this small. Speaking of which, the liquid-based CPU cooler does a good job of keeping things chilled, and the design of the chassis tries to maximise airflow around the graphics card too. In terms of performance, the quality components chosen for the rig make it a bit of a go-er. The GTX 460 is well-documented in these hallowed pages as the mid-range card de jour, and that quad-core i5-760 is going to do the business games-wise too. The Game Cube absolutely creams all the other rigs we've seen at this price. It even comes close to beating the £1,500 AdvanceTec ATFX Khaos. That only just keeps its nose ahead thanks to the Bloomfield i7 CPU. There are few niggles with this machine. Obviously, it's not built for the upgrader. The brilliant design of the chassis means that everything has its place, and you'll be hard pressed to even get at the components, let alone remove and replace them with upgrades. It also gets a little loud once you start gaming on it, although the distraction isn't too bad – it's nothing compared with the noise emitted from the Xbox 360's DVD drive, for instance. Upgrade/noise issues notwithstanding, CyberPower's Game Cube is brilliantly specced for the price, and is one hell of a performer. Once AMD pulls its finger out we can expect an even cheaper hexcore version too. The Game Cube then is truly a miniature marvel.